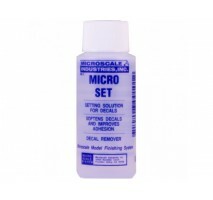 Micro SetDecal setting solution. It is used BEFORE setting the decal on the scale model. 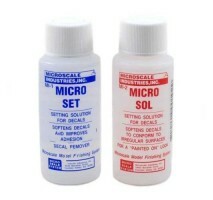 Used along with MI-2 Micro Sol30 ml bottle ..
Micro Decal FilmDecal rejuvenation solution, used on old, dried out, or low quality decals. 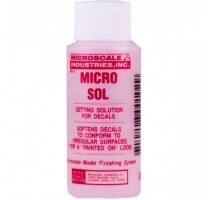 It is applied on the decal paper before wetting the decals for applying.30 ml bottle..
Micro SolDecal setting solution used AFTER setting the decal on the scale model. 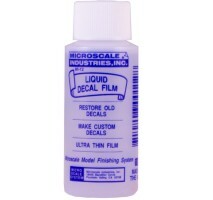 Helps decals adhere and softens them to stick on irregular and hard areas. 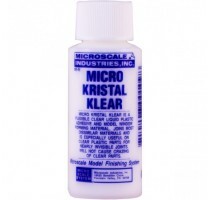 Used along with MI-1 Micro Set (click here)30 ml bottle..
Micro Kristal KlearAdhesive special designed for clear parts - canopies, windows, glass, etc. Does not affect in nay way the transparent parts.Can also be used for creating clear parts. 30 ml bottle..